I have heard good things about the Little Big Planet series and thought I’d give it a go after getting it for free from Sony. The game play is similar yet offers a completely different campaign than the PS3 version. The PSP version is a sequel where you reprise the role of Sackboy who wants to go on a vacation to tour the world. Your walkabout begins in Australia and ends in Brazil. Even though this is a sequel, I didn’t feel like I was missing out on anything since I haven’t played the original. The game starts with an introductory level that shows you the basics when it comes to movement, expressions, Sackboy customization, and sticker use. The controls are pretty straight forward. The arrow buttons change your sackboy’s expressions to happy, scared, determined, or sad. The nub makes you move and the L and R buttons let you push and pull things. The X button makes you jump and the square button brings up the Poppit menu. This is the menu that lets you use stickers, which are fun, but are also required at times. Another important option in this menu is the ability to retry from the last check point in case you get stuck. Exploration is encouraged, but sometimes it goes awry; fortunately, there is no penalty for respawning from the last check point. Strong Points: Excellent narration; Lovable and customizable character; fun campaign with the ability to download user made content. Weak Points: I had a hard time finding good community created levels. Moral Warnings: Halloween/Horror theme in one extra level; during the parade levels there are women in bikini's. The levels are themed around the part of the world you’re traveling. For example, when you’re exploring the Orient, you’ll see dragons, tigers, snakes, Oriental structures, and hear Oriental background music. Many of the levels have a quest giver that lets you know what has to be done to complete the level. The tasks vary from rescuing someone to getting across an obstacle course as fast as you can. Like many platfomers, you’ll be doing a lot of jumping and collecting items. 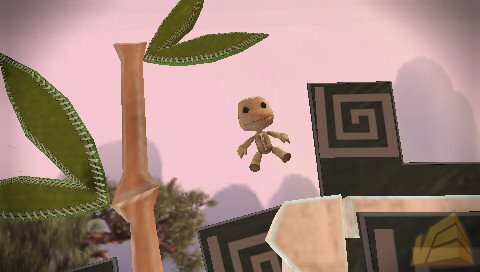 What makes Little Big Planet unique is that it’s not flat. You can jump in front of or behind many obstacles. You’ll also be able to fly using rocket packs and swing across lava pits, electric floors, spikes, and other death traps. When I did kill my Sackboy, the sound effects are so good that I felt guilty. The sizzle sound when getting burned, and the bzzzzzzzzt sound of getting electrocuted made me cringe every time. I did enjoy the background music and overall polish of the game. You can't go wrong with narrators with British accents! Physics play a big role in most of the levels, especially when you have to push and pull various objects into specific places. There are many hidden levels that can be unlocked if you can get to a well hidden key in the campaign levels. A good majority of these extra levels are hard and just plain aggravating. Many of them are racing levels that reward you for completing an obstacle course as fast as possible. Unlike standard levels, there are no check points, so if you die, you have to start all the way from the beginning. That can be very annoying when the whole level revolves around you balancing on a gigantic beach ball. Besides the single player campaign levels, you can play community made levels or try your hand at making a level yourself. Personally, I found the level creator a bit clunky and hard to use. It does have templates available for each world theme or you can start from scratch. I only played a few community made levels and the quality was nowhere near the professionally made ones. If you know of a good user made level to prove me wrong, please share it in the comment box! Between the single player campaign and the community creations, you can definitely get your money’s worth with this game. The retail price is a reasonable $20. It’s rated E and is pretty family friendly, but there are some levels with females in bikinis and one level has Halloween monsters including vampires, skeletons, and bats. If those issues don’t bother you, and you like platformers, Little Big Planet is a solid title to consider.